Bard is the latest champion to enter the roster of League of Legends. He is a unique support and one that I really wouldn’t mind playing. A new video shows off exactly what he’s capable of and will make him incredibly popular when he’s on his first free rotation. Here is his official spotlight. I really like this character design. It’s cool to imagine leaving health packs for your team mates under turrets. That’s definitely a way to keep everyone in the battle. Plus, that the packs become more powerful overtime adds to the risk-benefit evaluation. Added to that, Bard can grab his charms and get more mana, plus a speed boost and more keeps. Definitely gives a reason to go for a quick wander. I have a feeling there will be a lot of rage about a wandering Bard, though. A lane can quickly change from stable to chaos and I can just imagine the screams of frustration when a champion is killed because there wasn’t a support there to help. It will be important to communicate with your team, and might be worthwhile to leave some health packs behind before you go off chime collecting. 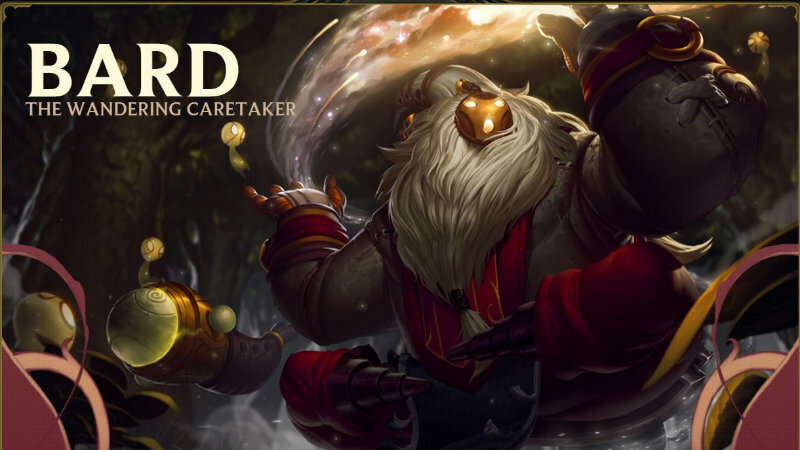 I’m seriously intrigued by Bard. He’s a new type of support, and one I wouldn’t mind fooling around with. I need to update my LoL launcher and give him a whirl – haven’t played any MOBA in ages and I think he might just be a reason to stop my roaming and return to the game.